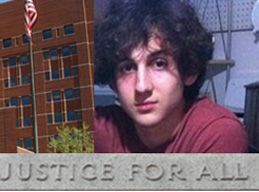 Jury selection is scheduled to begin Monday in the trial of Dzhokhar Tsarnaev, accused of the Boston Marathon bombings. Yesterday, hours after the trial court refused its most recent request for a continuance, the defense filed a petition for writ of mandamus with the First Circuit Court of Appeals requesting a change of venue, or in the alternative, an order compelling the trial judge to hold an evidentiary hearing on its change of venue motion. You can read it here. It also filed a motion in the trial court requesting that jury selection be delayed until the appeals court has ruled.